An exhilarating visual array of breathtaking motion-capture animation with a touch of the macabre! 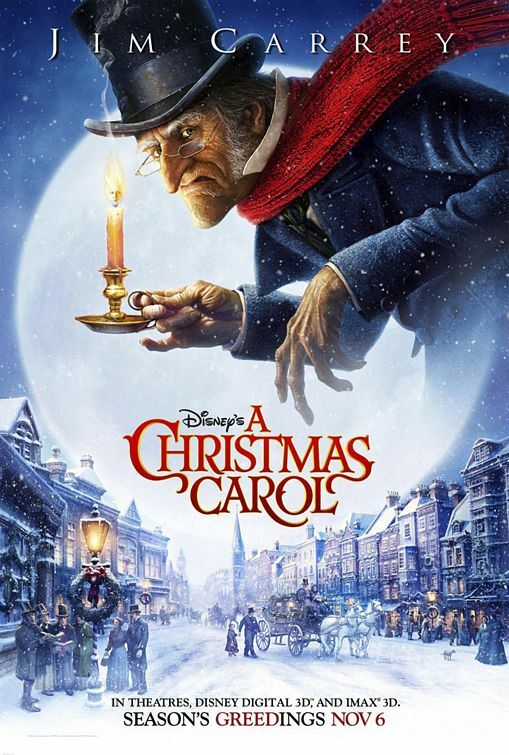 Disney’s A Christmas Carol directed by Robert Zemeckis is an outstanding adaptation of the literary classic. Instead of attending the cinema this week, with the box office offerings on the anemic side as we gear up for the bulk of Oscar season heavy hitters, I decided to rewatch Disney’s A Christmas Carol. Charles Dickens’ masterpieces have long sense been a source of inspiration for film adaptations of literature. Specifically, A Christmas Carol was actually one of the earliest films period–let alone adaptations. The first adaptation of A Christmas Carol was a British film in 1901 titled Marley’s Ghost. This classic work has been adapted for film, theatre, radio, and television more than 100 original/separate times, collectively. But why??? Why this novel? Quite possibly, this single work of literature has been brought to life for the stage, speaker, or screen more than any other with only a few possible exceptions. Perhaps, because it is simply timeless–transcends all generations. Writer-director Robert Zemeckis showcases his ability to put his spin on the timeless tale by perfecting the motion-capture animation techniques that made his adaptation of The Polar Express so visually stunning. Although Patrick Stewart’s Scrooge in the TNT original movie from 1999 is my favorite Scrooge, I feel strongly that Zemeckis’ film is closest adaptation to the spirit of the novel and brings it to life in the way Dickens himself may have imagined. London may be anxiously awaiting the arrival of Christmas Day, but the old miser Ebenezer Scrooge (Jim Carrey) could not care any less. He much prefers the company of his money and micro-managing his humble clerk Bob Cratchit (Gary Oldman) at his counting house. After begrudgingly allowing Cratchit to have Christmas Day off, Scrooge heads home. Upon arrival to his stately but lonely townhouse, Scrooge encounters the ghost of his dead–and there is no doubt about that–business partner Jacob Marley (Oldman). In an effort to spare Scrooge his horrifying fate, Marley informs Scrooge that he will be listed by three spirits (Carrey). The ghosts of Christmas past, present, and yet to come respectively take Scrooge on a terrifying journey through his his life in hopes of transforming his selfish bitterness and embrace the selfless love and joy of Christmas. Prior to analyzing this adaptation, as it is a story most of us know and cherish, I’d like to look at why. Why has this work of literature been adapted for nearly every storytelling medium? The short answer is that it is a story that is as relevant today as it was in the 1800s. Much like with his other masterpieces, Dickens captures so much about the human condition, in what amounts to a short story. The novel is not terribly long. With many in the U.S. feeling as though, much like in Dickens’ world, that we are being divided up into the rich and poor, this novel rings especially true. In fact, there are definitely high profile people in our economy echoing Scrooge’s words “have we no prisons; have we no work houses?? ?” Not that we have a physical debters’ prison or work houses (in the old fashioned sense), but there are certainly elements of our society which parallel them. The story hits close to home for many. Furthermore, the novel, and subsequent adaptations, are regarded so highly because Dickens encapsulated every aspect by which mankind judges one another: past, present, and future. This is the foundation of a single person or people as a unit. Through Scrooge, Dickens shows us that if we look at our past, present, and future, then we can see the impact we have on those around us and even ourselves. By seeing how we really are, we can make the decisions to develop an approach to change ourselves to be about the business of mankind. Interestingly, the ghosts show Scrooge how Christmas past was a time of magic (although it ended in heartbreak for Scrooge), Christmas present depicts how commercialism and greed have all but wiped out the magic with a glimmer of hope as shown by Cratchit and Fred, and Christmas yet to come shows Scrooge–and us–a world without the magic of Christmas: a world that we created. Another reason why this story is so powerful is because Dickens wrote the character of Scrooge to be a complex, multi-layered human who acts very much like a mirror to many of us. On the surface, he looks like a stereotypical old miser, but after looking into his past, we are given a glimpse of how he evolved–not unlike many of us. This story is also powerful for those who recognize the religious origins of Christmas or not. The focus of the story is on generosity, hospitality, love, compassion, as well as selfishness, greed, and sociopathy; but, it very much includes and makes reference to the religious underpinnings of this special time of year. Simply stated, this is a dynamic story of redemption that transcends generations of people. Zemeckis’ adaptation is a beautiful usage of 3D storytelling technology. Ordinarily, I am not a fan of 3D movies, but this one is an exception for sure. I did not watch it in 3D last night, but I remember watching it in 3D when it came out in 2009 at the [then] Downtown Disney AMC. Zemeckis is one of few directors who knows how to use 3D effectively without it seeming like a gimmick. His use of 3D in A Christmas Carol greatly enhances the visceral appeal of the movie. One of the principle differences between this and other adaptations is just how supercharged it is with visual effects, intense chase scenes, and flying through the street of London. But, as Scrooge himself acknowledged, spirits can do anything–they’re spirits. Zemeckis does not hold back on the dark elements of the story. If you have read the novel, you will recognize that there are very dark parts. In many respects, A Christmas Carol is a supernatural horror film. After all, how else was Scrooge going be so scared that he would make a 180 and change his miserly ways??? It’s no surprise that Jim Carrey can be seen in the character of Scrooge; however, it is not as apparent that he is the infrastructure of the look of the characters he voiced, as was the case with Tom Hanks’ characters in Zemeckis’ The Polar Express. And this trend is even less apparent with Firth’s, Oldman’s, and Wright’s, respective characters. I love Zemeckis’ embrace of the macabre mood of the story. So often, adaptations of this story lose the very horrifying elements that absolutely terrify Scrooge. Although I remember hearing parents comment that this version was too scary for their kids, I think that having a version that is skewed towards teens and adults was important. Another great element in this film: the score! Alan Silvestri’s score sneaks in some traditional Christmas carols, but you have to listen for such as “God Rest Ye Merry, Gentlemen” when its distinctive cadences turn sinister during a perilous flight through London. There are few Christmas movies that capture the spirit of the season better than A Christmas Carol. Zemeckis’ adaptation is my pick for best translation of page to screen. The cinematic excellence of Disney storytelling is woven throughout this film and makes for a thrilling journey. If you are planning to watch some Christmas movies this holiday season, I highly recommend this version of A Christmas Carol. But if you have very young children, it may be a little too scary for them. Whether you are young or young at heart, the magic of Christmas rings all too loudly in this timeless story brought to screen once again.